Some very exciting news: this weekend we’ll be hosting our very first workshop in the Mustard Seed Kitchen! 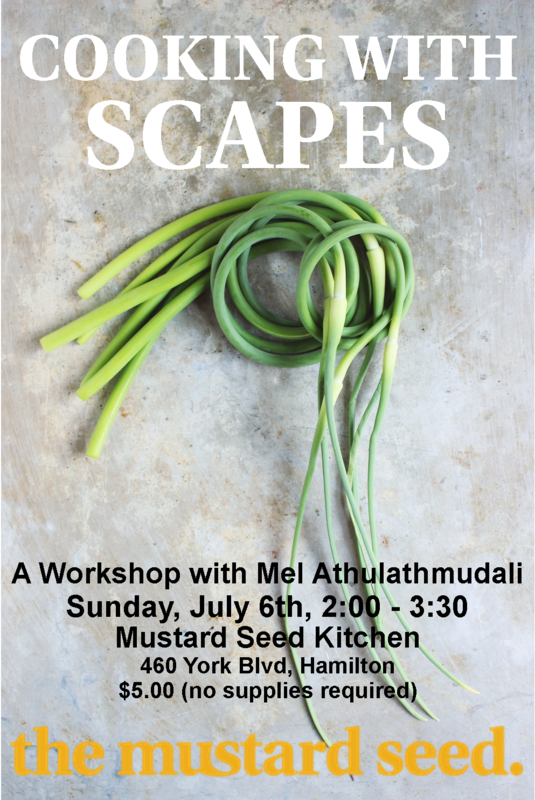 Join us for “Cooking with Scapes“, as Mel Athulathmudali teaches us about the garlic growing process, where scapes come from, and why we cut them. 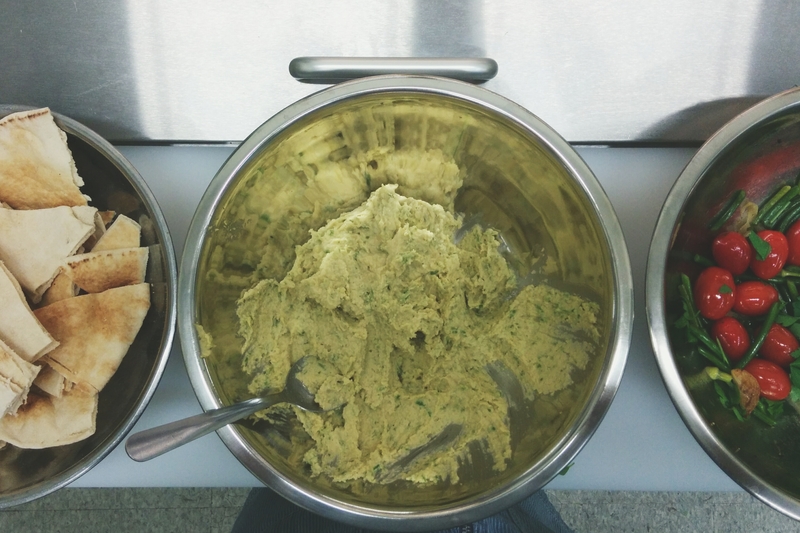 Then, though an interactive cooking demonstration, you’ll learn to make a few dishes, including a scape pesto, as well as an amazing hummus. Follow this link to register online. Join in on this great opportunity to learn more about scapes – a veggie treasure that is incredibly delicious, and so readily available in Ontario! The workshop was great! 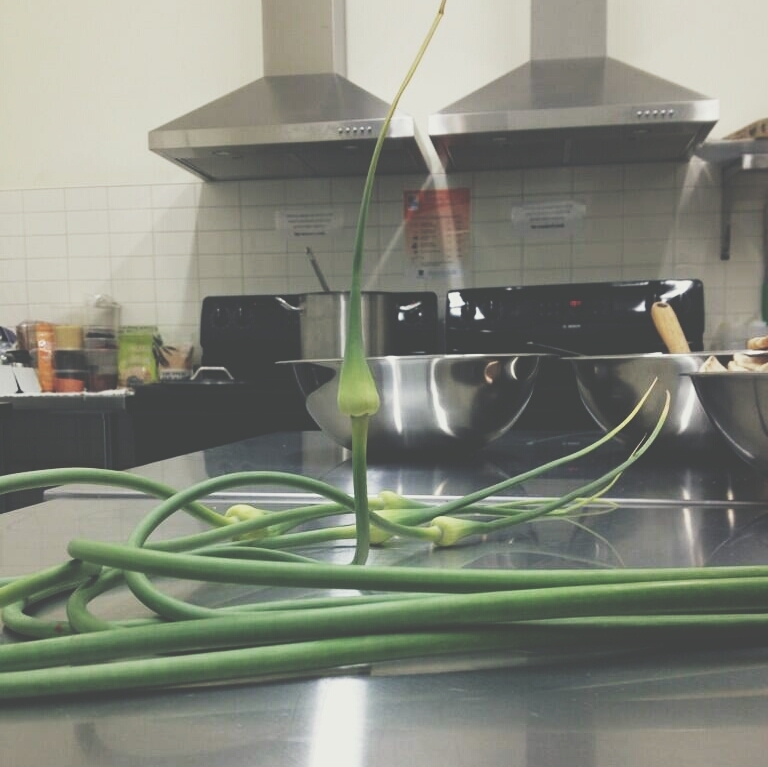 Wonderful turnout, delicious food, and we went home with so much great knowledge about scapes! Stay tuned to our Facebook page and blog for more information about upcoming workshops (including a cherry workshop on Tuesday, July 15th!) And for those of you who are looking for them, here are the recipes we walked through at the workshop. If you try them, feel free to post a photo to our Facebook page or tag us on Instagram (@mustardseedcoop) so we can witness your culinary delights! Put the first two ingredients in a food processor and process until they are well chopped. Add the cheese and process for about 30 sec more. Add the oil 1/4 cup at a time until the pesto is a thick paste (this will depend on the scapes’ age; the younger scapes are more tender and will break down faster). Add the lemon juice and pepper to taste. If it is too thick, process with more oil until it’s the consistency you want. Put the chick peas and scapes into a blender and process for 30 seconds. Add the tahini and oil and process until a thick paste forms. Add lemon juice and salt to taste. Heats the oil in a sauté pan over high heat until it’s hot, and then add the anchovy and sauté until it starts to break down. Add the scapes and sauté in the oil for about a minute or until they turn deep green. Add in the cherry tomatoes and sauté quickly for about 30 seconds or until the skins are shiny and the tomatoes have just started to soften (don’t sauté too long or they will break down and have a sauce-like consistency). Remove from the heat, stir in the parsley, salt pepper and capers and serve warm. Recipe looks really awesome! Can’t wait to try this out once i get back home!